"These products will yield 80% labor savings when compared to traditional light-inspection methods." The LightsOn 4-Flat C Trailer Light Tester is ideal for consumer utility, boat and small RV trailers. 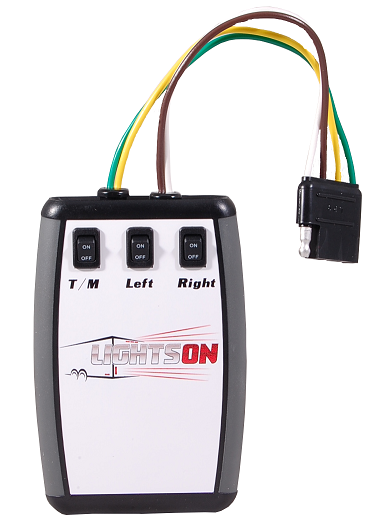 The LightsOn 4-Flat I Trailer Light Tester is ideal for industrial utility, boat and small RV trailers. COMING SOON! The LightsOn 7 Series are ideal for heavy utility trailers, large RVs and Semi Trailers. 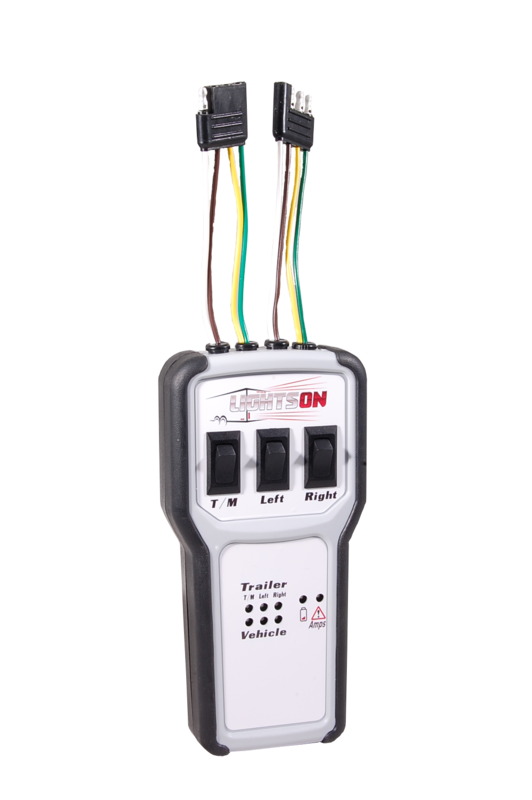 "Be efficient when performing your mandated DOT inspections and feel confident in the results"
The LightsOn 4-Flat C is a consumer trailer-light tester designed for use with small utility trailers, boat trailers or RV trailers. 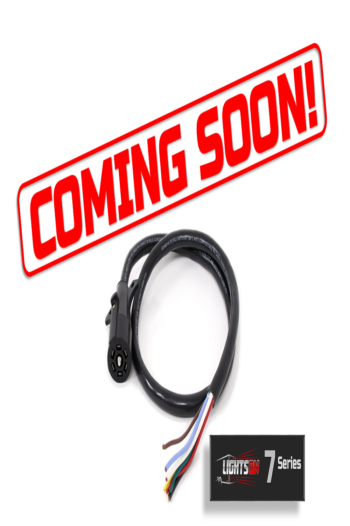 The tester includes the popular 4-flat connection, allowing users to plug the device into the trailer and provide the same voltage and user inputs (e.g. Brakes, Blinkers, Flashers, etc.) as they would if they were connecting a vehicle to the trailer. This allows for significant time savings and eliminates the need for a vehicle to be the power-supply when checking trailer lights. The 4-Flat C uses four CR-123a batteries. These batteries can be found at your local retailer or online when they need replacement. Save time, fuel and prevent accidents during inspections by using the 4-Flat C. This handheld device is ideal for occasional trailer light testing and safely tests up to 5 amp circuits. For more information on wholesale pricing, please contact us. The LightsOn 4-Flat I is an industrial trailer-light tester designed for use by individuals and businesses with multiple trailers and haulers. 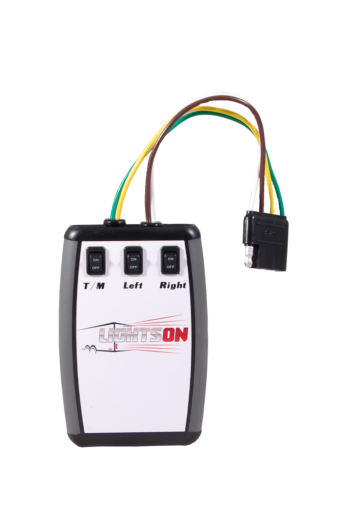 This device tests both the trailer side and vehicle side and uses LED indicator lights to display information. The tester includes the popular 4-flat connection, allowing users to plug the device into the trailer and provide the proper power and user inputs (e.g. Brakes, Blinkers, Flashers, etc.) as they would if they were connecting a vehicle to the trailer. This allows for significant time savings and eliminates the need for a vehicle when checking trailer lights during mandated DOT inspections. Improve efficiency during fleet inspections. The 4-Flat I gives you all the benefits and functions of the 4-Flat C at an industrial scale. Use this handheld device during daily trailer light testing and safely test up to 5 amp circuits.